What do you do when you have a defection rate of almost 40% and falling revenue per customer in a highly competitive industry? This was the problem faced by a large Fortune 50 telecommunications company recently. They knew that they had a problem, and management was willing to devote the resources to correcting the problem. They turned to Craig Wood and his team of marketing and technology experts at KnowledgeBase Marketing, Inc. in Chapel Hill, NC. As Group Vice President, Craig directs a team of strategic and technical consultants with skills in marketing technology and communications. An anniversary piece after 12 months. Everyone got the same communications. They cost an average of $7.38 per customer per year. The customer satisfaction indexes showed very high satisfaction, but 4 out of every 10 of these satisfied customers were leaving every year – most of them to the competition. One of KnowledgeBase Marketing’s first steps was to build a customer dissatisfaction program: find out who is unhappy and work to decrease the dissatisfaction. The company had no marketing database, so KnowledgeBase Marketing set about creating one to meet the needs of an enhanced program. They included both current customers and those who had dropped the service during the past three years. The new databases included calls to customer service and sales, and responses to marketing efforts broken into negative, positive, severe and mild. They also appended demographic data, including age, income, education and home value. Using this database with billing history going back for several years, they built predictive churn models that rated customers by likelihood of dropping the service. The basic principle of this matrix is to determine which customers you should work to retain, and which you don’t need to bother with. Those in Priority C were either of low value to the company, or had a low probability of leaving. Don’t waste money on these folks. Concentrate your resources on the valuable people (Priorities A and B) who might quit the service. This matrix reduced those customers included in the retention program from 100% to 44% — a tremendously cost-effective technique. To determine the value of customers to the firm, they determined everyone’s current lifetime value and their potential lifetime value based on their demographics. For example, a woman in her twenties might be currently using 1,200 minutes per year. Looking ahead, as her family expanded and her income grew, her potential might expand to 1,800 or more minutes per year. These calculations were built into a program which stored LTV and Potential into every customer’s database record. Rewards – working to modify customer behavior, and support those whose loyalty was important to the company. The relationship marketing consisted of a series of two way (survey and response) communications from zero “touches” up to eight per year, depending on the priority of the customer and their personal preferences and demographics. For those people in the retention program, they devised a customer contact strategy that included the same elements the client was already mailing: a Welcome package, an anniversary package, a retention questionnaire, and a cross sell package. In addition, KnowledgeBase Marketing introduced a rewards program for a very select group of high value customers. Once they had determined the appropriate communications, KnowledgeBase Marketing had to test various combinations to be sure that they would be effective in modifying behavior. 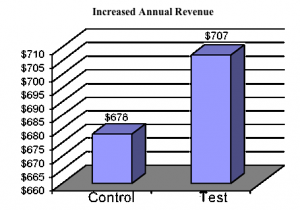 To do this, they created a communications testing matrix, which they tested on a relatively small number of customers. Senior management agreed to test four communication components: A, B, C, and D. There were three types of incentives: none, a few free minutes, and a lot of free minutes. 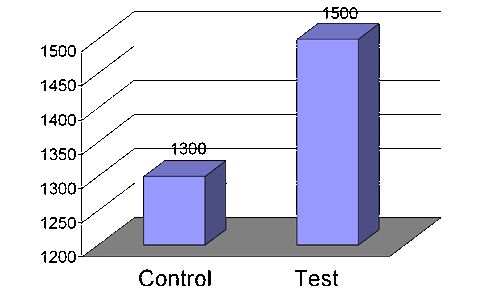 Each of the test programs was compared with the behavior of a control group that received no communications at all. One of the things that the team discovered in the testing phase was that the number of minutes given as a reward had little impact on behavior. People responded just as well to a few minutes as to a lot of minutes. The rewards were scaled back to just enough to make a difference. They also learned that the creative didn’t matter either. They tried two different creative approaches, one expensive and one inexpensive. Both worked equally well, so they retained the less expensive package. With the testing completed, they were ready for the rollout, comparing always the behavior of the customers they were trying to retain with those of control groups that received no retention building communications at all. The results were very gratifying. Within the target groups, churn reduction was even more dramatic. The overall rate of churn in the control group of the four priority cohorts (A and B) was 24%. Of those in these cohorts who were mailed the retention program, the churn rate was 18% — a decrease of 25%. Most of the retention packages called for a response from the customer. Of those who responded positively, the churn rate was 9%; this is the same churn rate for those customers who responded negatively but were able to have their dissatisfaction resolved by customer service. But response was not essential to reduce churn. The churn rate of the non-responders was lower than the churn rate of the control group that received no communications. Besides reducing the churn rate, the program also had a positive impact on phone usage and revenue. The average annual revenue from those in the retention program was 5% higher: $707 as compared to only $678 from identical people in the control group that did not receive the retention communications. The phone usage for the targeted groups also increased by 15% – from 1,300 minutes per year to 1,500 minutes per year. Perhaps most surprising of all, was the reduced cost of the communications. 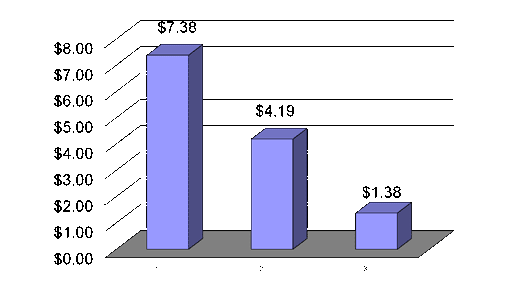 Previously every customer got five mailings per year for an average cost of $7.38. With the new retention program, the number of people mailed dropped by 56%. The highest value, highest risk customers received eight messages a year, while most other customers received less. The overall cost per customer of the communications however came way down in the third year to $1.38 because they were concentrating their messages on the 44% of the customers who were most valuable and most likely to churn. Creating a risk/revenue matrix that was used to focus attention on only those customers who were most valuable and most likely to churn. 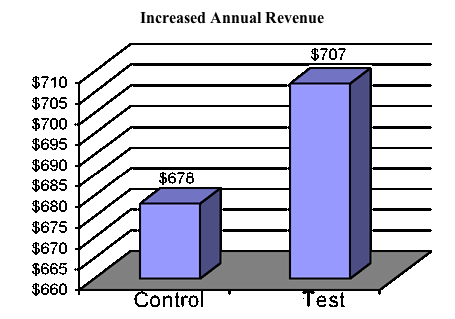 Measuring their success every step of the way against control groups so that they knew what was happening to churn, to usage and to revenue. 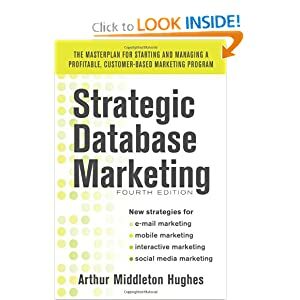 This is professional database marketing of a high order. My hat is off to Craig Wood and his team at KnowledgeBase Marketing.